What did you have for dinner last night? Do you even remember? If you're like me you likely don't remember what you did five minutes ago let alone last night! I was recently thinking how awkward it would be if someone walked up to me in the grocery store, asked me what I had for dinner last night and continued to judge me accordingly. If I said fast food their assumption might be I'm clearly not going to succeed in life - but if I said something like fresh, organic fruit with cage-free chicken breasts I'd be in the winner's column. Stay with me here when I make a leap. So why is it so different with breastfeeding? 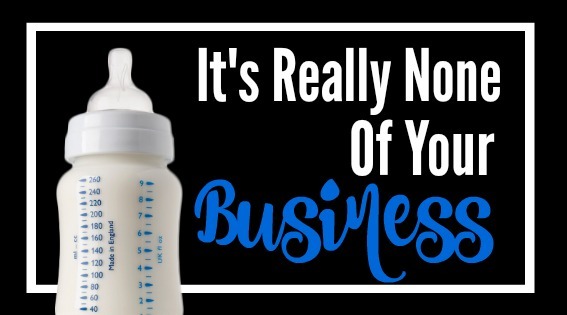 First of all, it's none of your business what I had for dinner and it's none of your business what my children eat - so asking me in the grocery store, or the mall, or the library or any number of places, whether or not I breastfeed my child is frankly none of your business. Furthermore, if you want to judge me based on my response then I challenge you to let me judge you based on your diet. My children are fed and happy and I care for them daily and if you'd like to judge me on anything, judge me on the amount of love I shower on my children daily. Ask me how many books I read my son before he went to bed the night prior. Ask me how many pictures we colored or birds we watched. Ask me if we played outside or built a fort. Ask me if I wake up in the middle of the night when he's scared and needs someone to cuddle with him until the thunder and lightning pass. Ask me if I put glowsticks in his bath or green food coloring in his milk to make an ordinary day extra special. Ask me almost anything about being a good caretaker for my children - if they are happy, say their prayers and have safe shelter. If you're really that interested go ahead and ask them if they've ever gone hungry. You know what they'd say. They'd say that they are cared for in every conceivable way. I do my best and I try to lead by example. They will tell you I cook homemade meals almost daily and that their little tummies are full. They would tell you that they've had so much fun since their last meal that they too can't remember what they ate - unless you are talking about the bugs outside. Here's a tip that will make all mamas feel better - just don't ask. What are you getting out of the knowledge that my child is breast or bottle fed? Will the information in any way change your day or outlook on life? But when you ask me, it is invading my personal space. It makes me feel judged and while you might walk away and never think about the conversation again, I will turn it over and over in my mind before bed for weeks. Don't make me lose sleep because of your insensitivity. Really when was it ever any of your business what we eat for dinner. Yes, I'm saying this as I look at the frozen pizza, potato chips, and heaps of premade donuts in your grocery cart. I'm not asking you what's on the menu tonight. If you are a breatfeeding mama check out these great nursing essentials! I sure wish the judgement would stop. Being a parent is hard enough! Let's support eachother, not tear everyone down so they feel better about themselves for 5 minutes. I couldn't agree more. If we put our time and energy into lifting each other up can you imagine how successful we would be as mothers and just people in general? I don't know why so many of us have to try to tear one another down. The judgements or passive aggresive comment. Are so unnessary. We should be supporting one another through this time in our lives. Great post! Thanks for sharing. Love this post, Brittany! I think it is so important for mamas to build each other up, not knock each other down.